We may be starting work soon on a couple of Cameron properties that are either historically significant or at least interesting. As we patiently wait to complete the transactions on them, we’ve been looking into what we want to do and how we want to do it. At first, Lee was not interested in getting the Gillis House declared a historic building, because he was worried we wouldn’t be able to make the modifications we want, but since then he’s found out that if you are on the state or national historic registry, you could get tax credits for up to 40% of renovations. The city is working on funding to create a downtown historic district, which we would make sure includes that house (and the church, too). That would be more cost effective than applying for each building individually. But, that’s in the future. Aha, rehabilitation probably what we want to do with most of the older properties we purchase here. 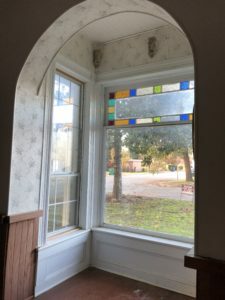 Curved ceiling and stained glass in a front window at the Gillis house. Let’s keep it. This house was built around 1905, so it would be a shame to remove any of its exterior features that remain (it has had some updates, and I don’t think we are up to a restoration, like taking it back to the original facade). But to be livable, certain things just have to happen. We can’t make it back into an office on the bottom floor and dwelling on the top (well, we could, but it wouldn’t fit in the neighborhood anymore) and we don’t want to turn it into a duplex, either. We know we need an interior stairway and a functioning kitchen (at least) in the house, and probably another bathroom or two, but we want to retain its charm as much as possible (and not turn it into one of those places with historic exteriors and ultra-modern interiors, since that just won’t fit in here in rural Texas). We could easily retain these vintage features, while adding more modern touches elsewhere in this 50s kitchen. We just made an offer on a house that needs to be fixed up, but has remarkably intact original kitchen, bathroom, and flooring from the 1950s. Although one current trend for older houses is to rip out all those “dated” features, there is another school of thought that seeks to preserve the original charm, when it can be done. If this project goes forward, we are considering keeping the built-in flower planters on the outside, the cheerful yellow-tiled kitchen, and maybe even as many elements as possible in the pink-tiled kitchen. 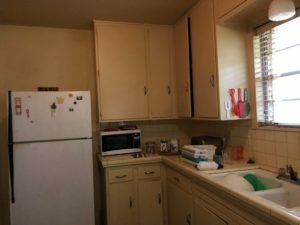 The original cabinets and many other kitchen features were lovingly cared for by the house’s one previous owner, and we are thinking there are many people who would like the house freshened, but not totally gutted. And if we don’t get this particular house, there are many others around here that might be canditates for a historic rehabilitation. It’s a great way to re-use and recycle things that are still in good shape, which reduces the considerable waste that renovations can create. Besides, I always admired the work the Nicole Curtis on the Rehab Addict television show focused on, which kept old character in houses, as much as possible, so maybe we can do that, too! Love your articles and thank you Hermit Haus Redevelopment for investing in our community. You are greatly appreciated.